Heading into the holiday-shopping season, these are the top rated retail stocks by Wall Street analysts. It's only fitting that Wall Street is back in love with America's quintessential department store. Investors like the merchandise in Macy's (M) stores and they're betting consumers will too this holiday season. They're also applauding the company's efforts to compete with the e-commerce world by keeping up a robust online presence and testing out new technology like tablets in fitting rooms, mobile payments and personalized deals to shoppers. "Macy's is doing everything right as a retailer," said Brian Sozzi, a retail analyst and CEO of Belus Capital Advisors. About 80% of the Wall Street analysts who cover Macy's have buy ratings on the stock and no analysts have a sell rating. The average price target of $64 implies a gain of nearly 8% from the stock's current level. 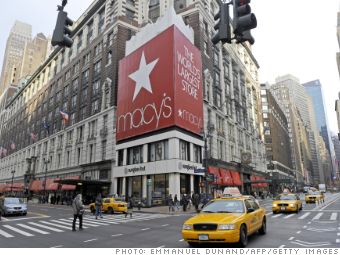 Macy's shares look cheap compared to other stocks. They're trading at a price-to-earnings ratio of about 11.8, based on forward earnings estimates. That's a lot less expensive than the 16.6 PE ratio for the S&P 500 index. The company reports earnings Wednesday and is expected to say sales ticked up during the latest quarter. "We believe Macy's great brands and exclusive merchandise provide the right combination of fashion and quality at an appealing price," Stifel Nicolaus analyst Richard Jaffe wrote in a recent note to clients.